The end of week one of the Australian is when things began to heat up, which is often the case in tournaments of two week duration- the majors. First, did you see it? The longest women’s match in grand slam tennis history? ** After four hours and 44 minutes, 2010 French Open winner Francesca Schiavone, of Italy, finally defeated Svetlana Kuznetsova, the French Open winner in 2009, 6-4 1-6 16-14. It wasn’t even close to the 11 hour Wimbledon thriller in 2010 when John Isner beat Mahut in the final 70-68. But it was still an exciting match. Both women played their hearts out in a contest of very high quality tennis, in which both players destroyed winners with amazing footwork and quickness , which made for astounding defensive play. "My elbow is too fragile and hurt... Having followed the advice of doctors it is now clear and I accept that here my career ends. "I'm sorry ... I had hoped for a different return and dreamed of a different ending." Meantime, Schiavone was defeated by #1 seed Caroline Wozniacki in the quarter finals in a match that saw Schiavone once more play her heart out, while Wozniacki hardly broke a sweat. 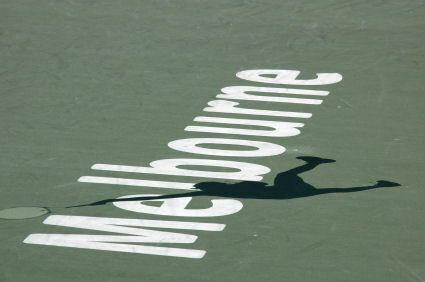 There have been several upsets among the women: Samantha Stosur and Maria Sharapova were booted out. Kim Clijsters defeated Agnieszka Radwanska, only to face #2 seed, Vera Zvonerva in the semifinals. And top seed Caroline Wozniacki will face Na Li. Both matches are being played tonight, EST on Tennis Channel and ESPN2. In week #1, we had to say goodbye to the Americans in singles competition with the exit of Andy Roddick and John Isner, and Venus Williams, who withdrew because of injury. On the other hand, the doubles turned out somewhat better. In women’s doubles, Americans Bethanie Mattek-Sands and Meghann Shaughnessy got as far as the quarters. The Bryan brothers, the top seeds, have made it into the finals after today's defeat of American Eric Butorac and his partner, Jean-Julien Rojer of Curacao. In men’s singles, most of the other top seeds have survived: Roger Federer, Andy Murray, and Novak Djokovic. Although Caroline Wozniacki is the #1 seed, Kim Clijsters is favored to win. At the moment, the burning question is whether Federer can overtake Novak Djokovic (who beat him in the semis at the 2010 US Open) to make the finals, where he would meet either David Ferrer or Andy Murray. It's Ferrer, remember, who last night robbed Nadal of a fourth straight Grand Slam win. A win for Federer would mean one more slam in his basket of records for a total of 17. Could anyone ever catch up with that? Stay tuned. Because of the 15 hour time difference between EST and Australia, you can see live matches on ESPN2 if you stay up through the night. Tennis Channel repeats all of the matches from about 8 a.m. to 2 p.m. during the day, and the ESPN2 takes over the repeats from 3-7 p.m., when the live matches begin and are televised until 8 a.m. If you have all that time, you can see just about everything on TV. You can also see the matches online at www.ESPN3.com, www.fromsport.com and www.channelsurfing.net.